Since 1939, traders, investors, analysts, portfolio managers, and speculators around the world have relied on the Commodity Research Bureau to help them navigate the uncertainties of the commodity markets. 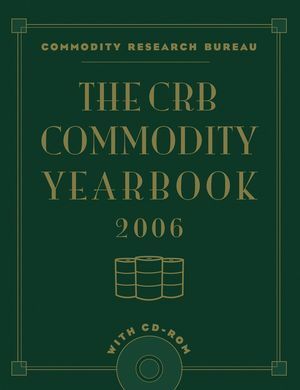 Covering everything from alcohol to zinc, The CRB Commodity Yearbook 2006 and The CRB Encyclopedia of Commodity and Financial Prices cover everything commodity market specialists need to know. Both of these exhaustive guides include companion CD-ROMs that provide valuable commodity information in an easy-to-use format. Packed with data, including charts, tables, and graphs, these two books are indispensable resources for every professional in the commodity markets. COMMODITY RESEARCH BUREAU, a division of Logical Systems, Inc., is the country's largest resource for financial statistics, historical data, and charting services. Information is available online, on CD-ROM, and through newsletters, charting services, and wire reports. Located in Chicago, the company is regarded as the leading source of information on international and domestic commodity movements. Fertilizers (Nitrogen, Phosphate & Potash). Rayon and Other Synthetic Fibers.